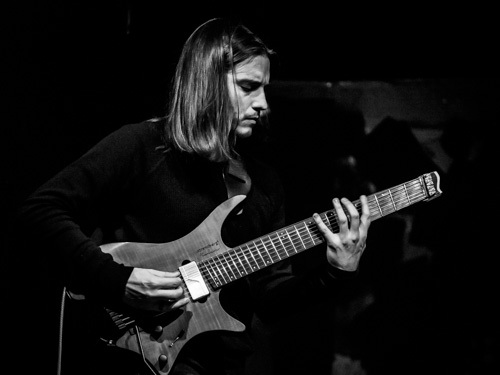 Álvaro Domene is a Madrid-born, New York based guitarist and composer operating at the convergence of various styles of contemporary creative music. His sound and compositions are influenced by the avant-garde jazz and modern classical traditions, as well as metal music. He has performed and taught internationally, and recently worked with Joe McPhee, Karl Berger, Elliott Sharp, Henry Kaiser, Briggan Krauss, Michaël Attias, Jim Black, Ben Goldberg, Michael Bisio, Colin Marston, Mike Pride, Ches Smith, Scott Amendola, and Fred Lonberg-Holm. He is an active performer in New York’s creative music scene, leading various groups in addition to working with numerous artists. His work has been positively reviewed by Jazzwise, New York City Jazz Record, All About Jazz, Guitar Moderne, El Intruso, Tomajazz, The Free Jazz Blog and many other specialized media outlets like Avant Music News, on which a recent release, “Synaptic Self” by the trio dMu, was included in the list of “Best Albums of 2016”. Álvaro’s latest and first solo record, “The Compass”, was a “Recommended New Release” on The New York City Jazz Record, and Avant Music News featured it on their “Best Albums of 2018” list. New recording projects are scheduled to be released throughout 2019, such as “Expressed By The Circumference”, (featuring New York’s experimental icon Elliott Sharp and long-time friend Mike Caratti), Karl Berger’s new group “Música Poética“, “Live At Singularity Music Series I” (with soprano saxophone master Sam Newsome and drummer Mike Caratti), “The Anatomy of Light” (debut by Sly Horizon, new group with trombonist Rick Parker and drummer Jeremy Carlstedt), “Putrid Tendency” (debut by avant-garde metal trio Catatonic Effigy, featuring Gorguts bassist Colin Marston and drummer Mike Caratti), and “The Ghost Train” (duo collaboration with experimental guitar pioneer Henry Kaiser). Also, Domene’s composition “The Hive” will be featured – along with pieces by fellow guitarists Liberty Ellman, Reg Bloor, and Anthony Pirog among others – on the new Clean Feed solo guitar compilation album “I Never Metaguitar V”, curated by Elliott Sharp. In addition, Álvaro co-runs Iluso Records, an independent record label dedicated to support and disseminate creative new music, and he is also the artistic director at the Singularity Music Series in Kingston, New York.